Why Are Robin Eggs Blue? Spring is a season of lovely colors, from the pretty pinks of tulips and tree blossoms to the sunny yellows of daffodils and baby chicks to the soft, beautiful blue of robin's eggs. 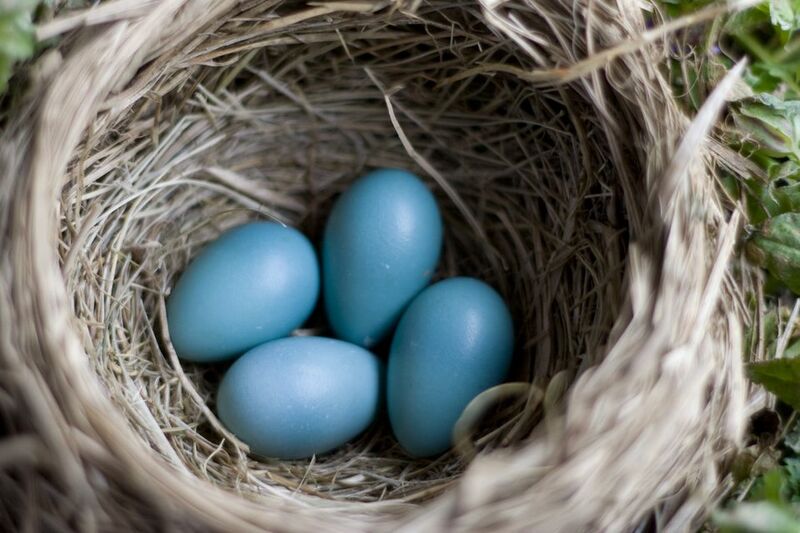 But why are robin eggs blue, and what can colors reveal about wild bird eggs? Blue is not the only pretty shade found in wild bird eggs. Eggshells can be a rainbow of hues, from simple white, cream, buff, and tan shades to lavender, mint green, yellow, teal, gray, red-orange, pink, and blue-green. Eggs may be plain, or they may have markings in different colors, such as red-brown, deep purple, black, gray, or green. Spots, flecks, specks, splotches, blotches, and squiggles can all be marked on eggs and add to their color variations. Furthermore, some eggs may even be stained from nesting material, particularly in wet areas such as marshes or wetlands where decaying plants can leave smudges on eggshells. In many cases, color helps camouflage an eggshell from hungry predators that are happy to raid nests for an easy meal. This is especially true for eggs with neutral tones or those that have markings that help them blend into nesting material. Many birds that lay eggs in the open, such as in a scrape nest or directly on the ground in open areas, have such camouflaged eggs. The birds with those camouflaged eggs will often decorate their nests as well, to provide an additional layer of protection and concealment. The color of a bird's egg can also protect it from harmful sunlight. The radiation and heat from the sun can easily damage delicate eggs, both by influencing chick development and impacting the incubation period. A very dark egg, for example, will have better protection against harmful ultraviolet (UV) radiation, but it will also heat up too quickly in direct sunlight and the extreme temperature could kill an unhatched chick. A lighter egg is less subject to the stress of overheating, but more at risk for developmental problems caused by UV radiation. When an incubation period is strongly affected by heat from the sun, chicks are subject to greater mutations and higher fatalities because their development is rushed. Because of the connection between sunlight and eggshell color, shell colors vary based on the geographic range of a bird species and where they lay their eggs. Birds that typically lay eggs in open, exposed areas likely to see more sunlight often have lighter-colored eggshells. Eggs laid in concealed locations sheltered from the sun are more likely to be darker hues. Ultimately, birds need to strike a balance between the best color for their eggs and the environmental conditions where they lay those eggs. That is an evolutionary process that can take many generations to perfect, and even birds in the same species may have slightly different eggshell colors based on their range and habitat preferences. Health of Parent and Chicks: Brighter, more colorful eggs (within the proper colors for the species) are typically a sign of good health and a nutritious diet for the mother bird. Those hatchlings are more likely to be strong and healthy as well. Nest Care Habits: While not a universal characteristic, it is typical that heavily camouflaged eggs are often part of nests that are often left untended as parent birds forage. Plain, more conspicuous eggs, on the other hand, may be guarded more carefully by watchful parents and have less need for camouflage. Mismatched Siblings: Dramatically different eggs in the same nest can indicate a brood parasite. These birds, such as brown-headed cowbirds and common cuckoos, lay their eggs in the nests of other birds, and let other species raise them as "foster" chicks. An egg that is a vastly different size, shape, or color in the brood may be from a brood parasite. But, Really, Why Are Robin Eggs Blue? While understanding eggshell color is fascinating, it doesn't fully explain why robin eggs are blue. The color of an eggshell is determined by pigments deposited as the shell is formed in the shell gland. The shell gland is the avian equivalent of a mammal's uterus and is near the end of the oviduct, just before the cloaca. The shell is formed just before the egg is laid. The bile pigment biliverdin is responsible for blue tones in bird eggs. Depending on the concentration of the pigment, the coloration can range from bright, bold blue or blue-green to pale blue and every shade in between. Smaller eggs and those laid first in a brood are usually more intensely colored than larger eggs or those laid later in the nesting cycle. In addition to coloring eggshells, biliverdin is also responsible for blue tones in moth and butterfly wings, and is the same pigment that makes bruises turn bluish-green. Regardless of the species, however, the same principles that explain why robin eggs are blue explain the bluish coloration of all different wild bird eggs. Birders who understand egg coloration can more easily identify wild bird eggs and appreciate all the special qualities of each nest they see.